"Changing the Way We Change"
ChangeU International is revolutionizing performance management linking it back to individual KRAs (Key Result Areas) and KPIs (Key Performance Indicators). ​● 90% of companies that use Performance Appraisal are dissatisfied with it. ​● Imagine your team members and your KPIs all in 1 page. ● Focus on the right meaningful information and KPIs unique for every single individual in the company. 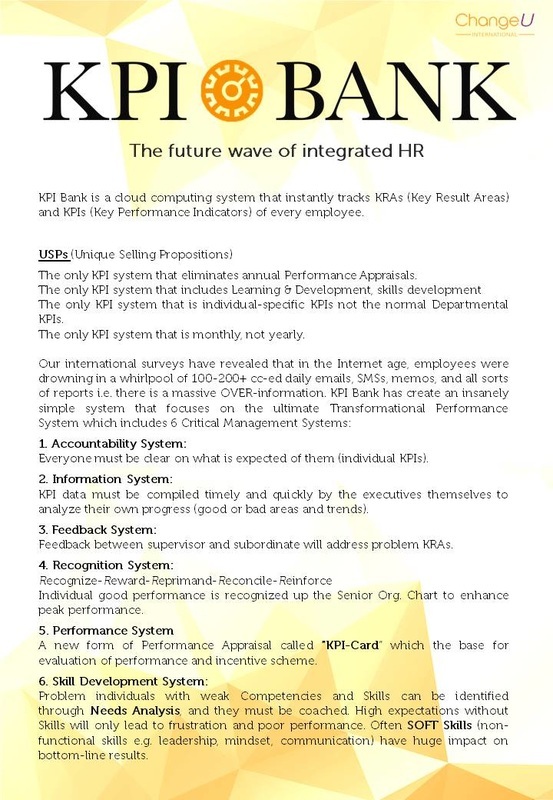 If you are drowning in a whirlpool of 100-200+ cc-ed daily emails, memos, and all sorts of reports, the KRA-KPI e-Card may be your corporate life saver! This insanely simple system is being used successfully by Fortune 500 Managers from Across-ALL-Industries. ▪ Page 1: identifies and prioritizes your own Self KRAs (6 Key Result Areas). Self KPIs are different from Company or Department KPIs which are way too general. It must be directly relevant so that the individual can feel excited that he/she has a direct control, responsibility, and influence over one’s KPIs. ▪ Each KRA is measured by several KPIs (Key Performance Indicators are measures of business performance). ▪ Each KPI has 3 levels of benchmark-goal setting i.e. minimum/ stretch/ transformational goals. ▪ Page 2: monitors KRA-KPIs of your Subordinates. (good & bad trends, problems areas). Use this MONTHLY e-Card system rather than using the dreaded once-a-year PERFORMANCE APPRAISAL. Our global survey reveals that Performance Appraisals are of-times not useful, not given much importance, and conducted haphazardly and in a hurry. It is a 6-in-1 system covering Accountability, Information, Feedback, Recognition, Performance, and Skill Development systems. Everyone must be clear on what is expected of them (individual KPIs). KPI data must be compiled timely and quickly by the executives themselves to analyze their own progress (good or bad areas and trends). Feedback between supervisor and subordinate will address problem KRAs. Individual good performance is recognized up the Senior Org. Chart to enhance peak performance. A new form of Performance Appraisal called “KPI-Card” which the base for evaluation of performance and incentive scheme. Problem individuals with weak Competencies and Skills can be identified through Needs Analysis, and they must be coached. High expectations without Skills will only lead to frustration and poor performance. Often SOFT Skills (non-functional skills e.g. leadership, mindset, communication) have huge impact on bottom-line results. Be certified as a KPI Bank Professional who is qualified to implement and monitor the KPI Bank system in any organization. Our Certification Team is made up of top KPI Experts from across-all-industries. Our KPI Bank Experts can custom-make Industry-specific KPI Bank systems in your organization.